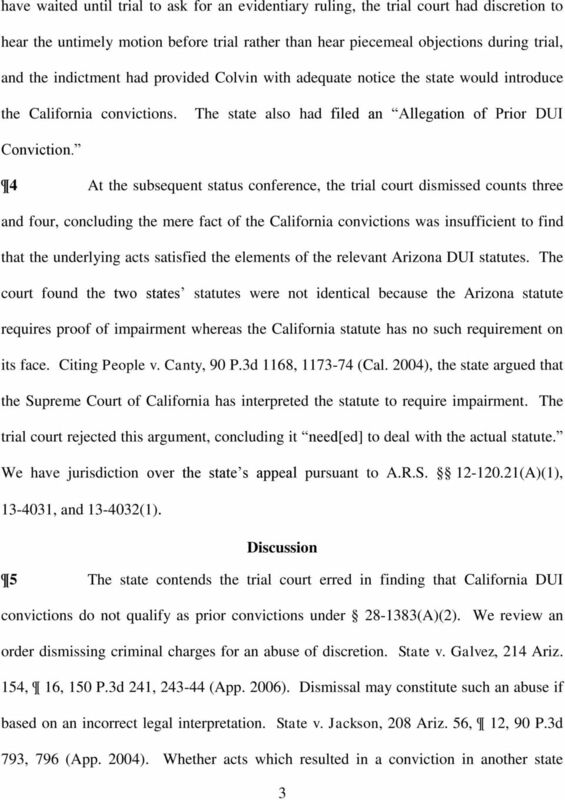 Download "IN THE COURT OF APPEALS STATE OF ARIZONA DIVISION TWO ) ) ) ) ) ) ) ) ) ) Appellant, Appellee. 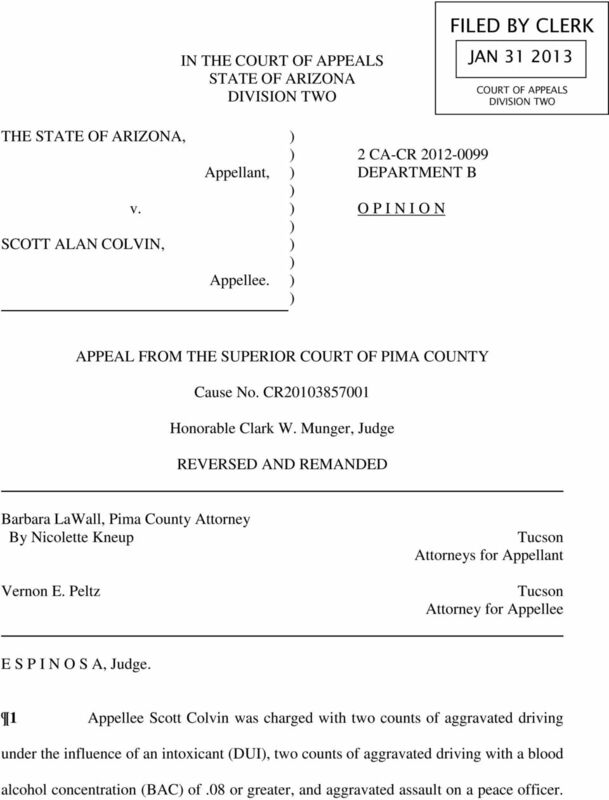 APPEAL FROM THE SUPERIOR COURT OF PIMA COUNTY"
1 IN THE COURT OF APPEALS STATE OF ARIZONA DIVISION TWO FILED BY CLERK JAN COURT OF APPEALS DIVISION TWO THE STATE OF ARIZONA, v. SCOTT ALAN COLVIN, Appellant, Appellee. 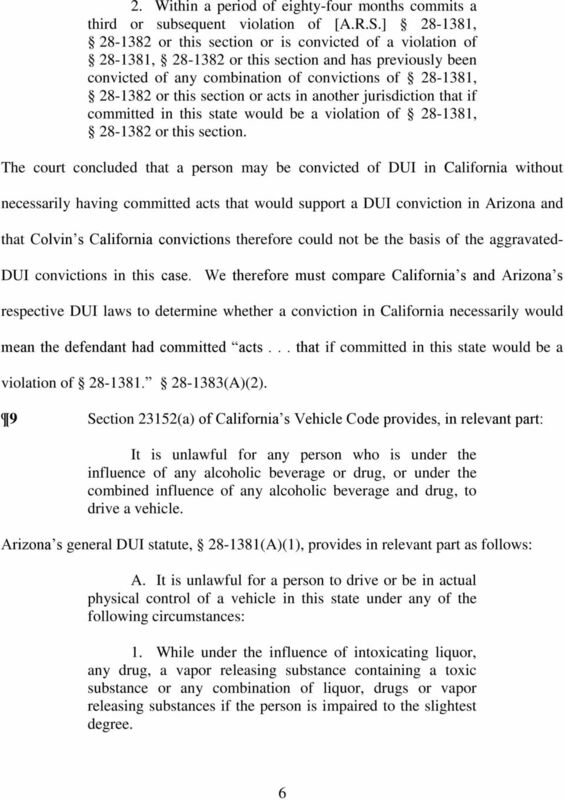 2 CA-CR DEPARTMENT B O P I N I O N APPEAL FROM THE SUPERIOR COURT OF PIMA COUNTY Cause No. 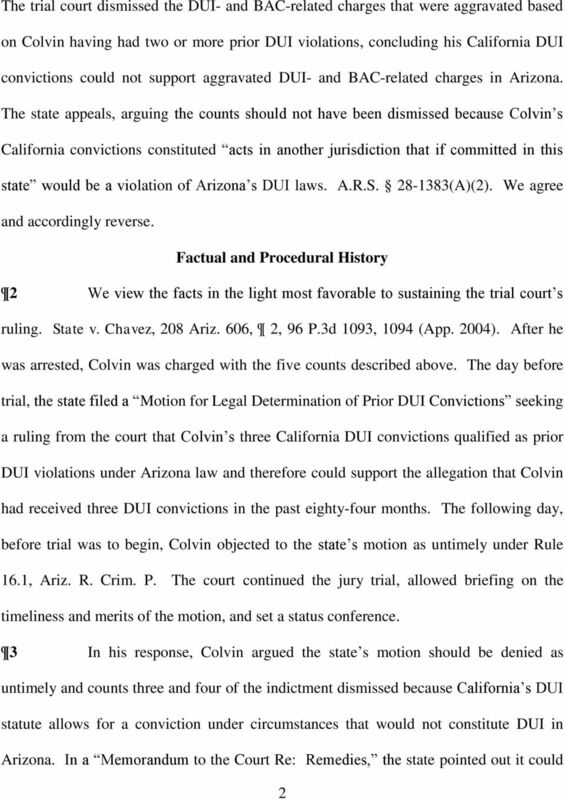 CR Honorable Clark W. Munger, Judge REVERSED AND REMANDED Barbara LaWall, Pima County Attorney By Nicolette Kneup Vernon E. Peltz Tucson Attorneys for Appellant Tucson Attorney for Appellee E S P I N O S A, Judge. 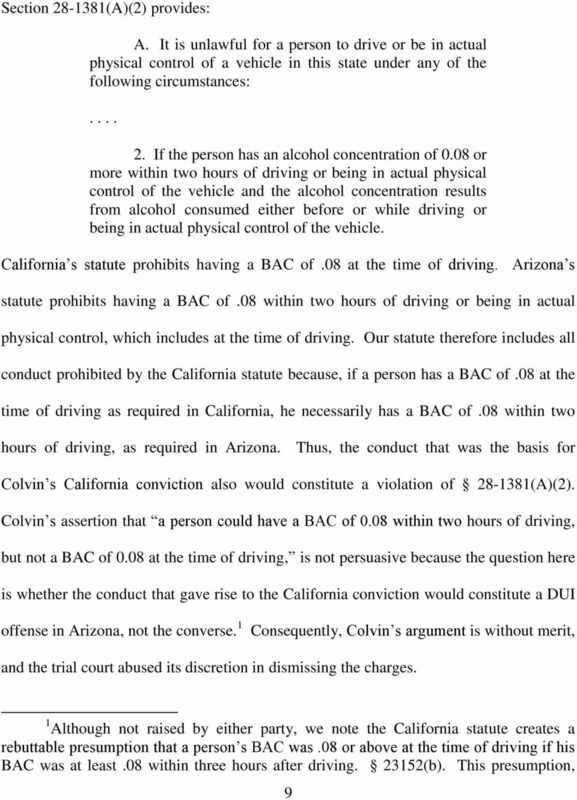 1 Appellee Scott Colvin was charged with two counts of aggravated driving under the influence of an intoxicant (DUI, two counts of aggravated driving with a blood alcohol concentration (BAC of.08 or greater, and aggravated assault on a peace officer. 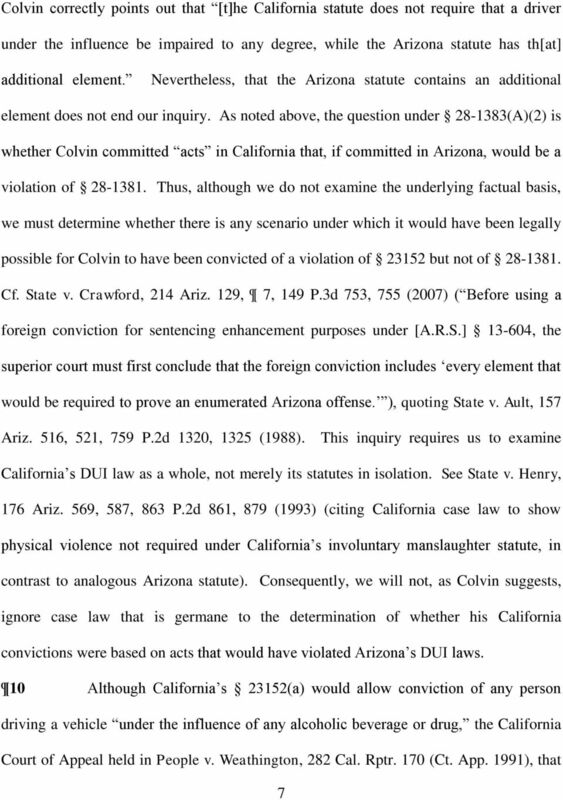 STATE OF ARIZONA ) ) 1 CA-CR 01-0226 Appellant, ) ) DEPARTMENT C v. ) ) O P I N I O N ALBERTO ROBERT CABRERA, ) ) Filed 4-23-02 Appellee. IN THE SUPERIOR COURT OF THE STATE OF DELAWARE IN AND FOR NEW CASTLE COUNTY ANN M. BAKER, ) ) Defendant-Below, ) Appellant, ) ) v. ) I.D. No. 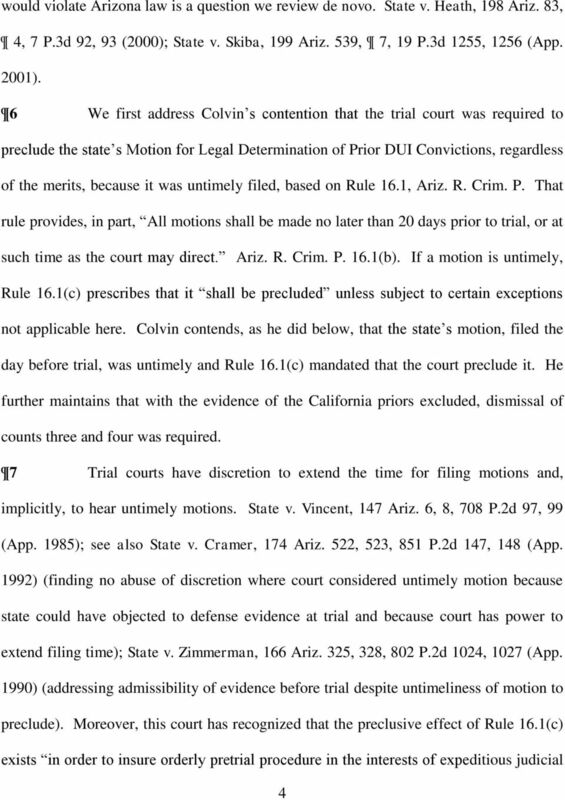 0803038600 ) STATE OF DELAWARE, ) ) Plaintiff-Below, ) Appellee. IN THE COURT OF APPEALS OF IOWA. No. 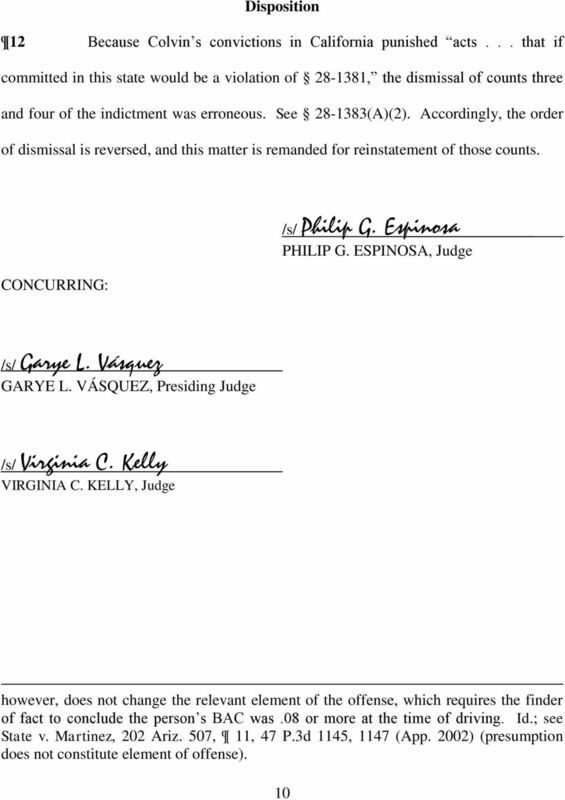 14-1632 Filed August 5, 2015. 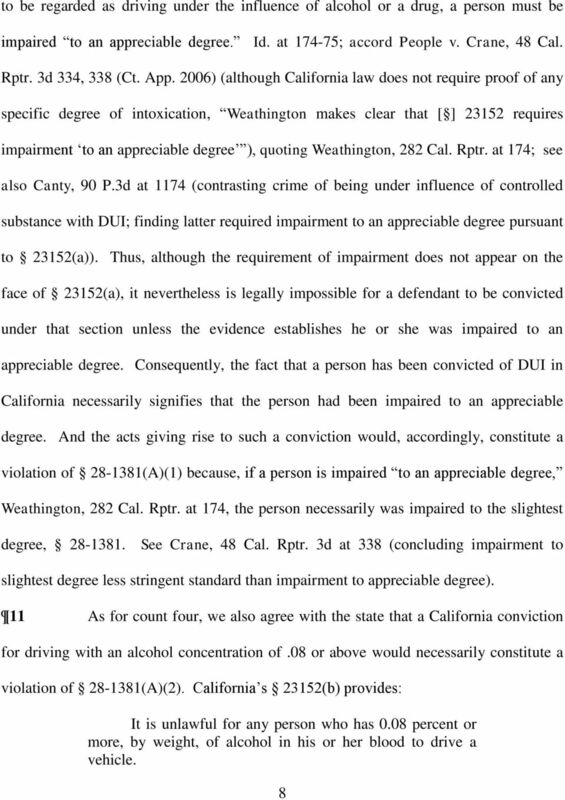 Appeal from the Iowa District Court for Clinton County, Paul L.
IN THE COURT OF APPEALS FOR THE STATE OF WASHINGTON STATE OF WASHINGTON, Respondent, v. RASHAD ASKIA SWANK, Appellant. No. 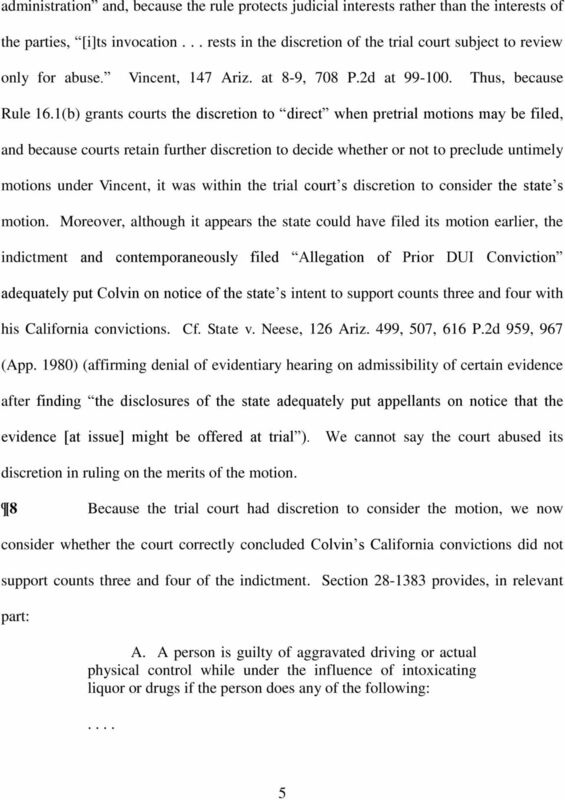 67327-1-I DIVISION ONE UNPUBLISHED OPINION FILED: September 24, 2012 Leach, C.J.